other fashionistas. I love mine and it is such an amazing statement piece to dress up any simple outfit. This giveaway is open to everyone and it ships INTERNATIONALLY. here and on Twitter by clicking here. 2. Like this post on Bloglovin' by clicking here. Twitter or your blog and link back to this post. Looove this ring!! Wow, I really really wish I won this. I've wanted it for the longest time and this is the prettiest colour ever. ♡ It's my bday today and this would be the best gift. My contact email is topcoatblog (at) yahoo (dot) com. OMG! 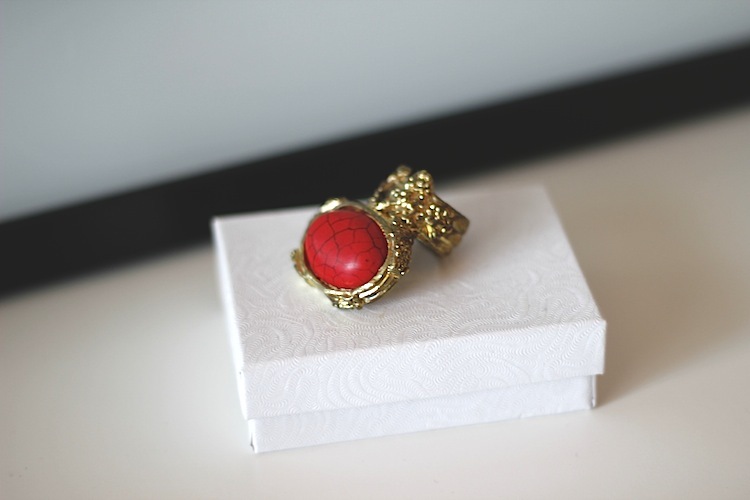 Super love this ring! Oh please!!! Hope I'll win. I mentioned the giveaway on Facebook and tagged your account as I don't know how to get the link... hope that's okay? Really really love the ring! *crossing my fingers* and I have shared and started following on bloglovin'. Thanks and hope I win!! !